And now, Scary-Crayon presents a special, action-packed, hippie-hating, CHREESE-filled edition! Dairy Free Mac & Chreese!!!! Alice: Okay, what the hell is up with this?? Dairy Free? Certified Organic? Whole Wheat Pasta? Sounds like dirty hippie food to me... Lets turn it over and find out. Alice: Oh god, it's worse than I thought!!!!!!! Alice: Soy & Nut Free?? 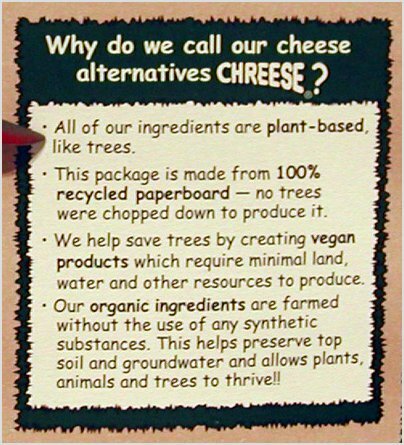 I thought that dirty hippie vegans LIKED soy and nuts? Kosher? Well that's important, for all those Jewish vegans out there. 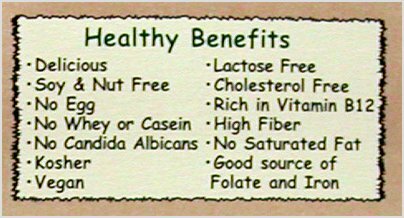 Good source of folate and iron... vegans need that because they don't eat meat! Now what the hell is "candidia albicans"?? That sounds like some sort of nasty venereal disease!! Ryoko: Why the hell do they call it ch-r-eese anyway??? Alice: Oh my god, this is worse then I thought. 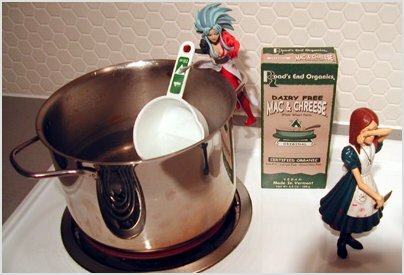 Ryoko, we must destroy this "Mac & Chreese" right away, before this dirty hippie food infects the whole world!!! Ryoko: Why don't we cook it first, then chuck it out? That way no one else will be tempted to make it, and hey, maybe it will taste good!! 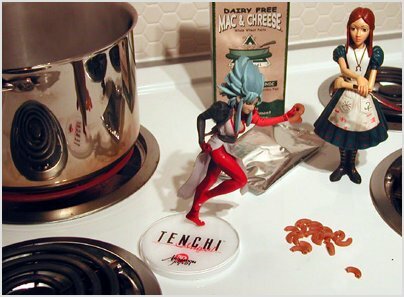 Alice: Look at the ingredients... there is NO WAY this could ever taste good! 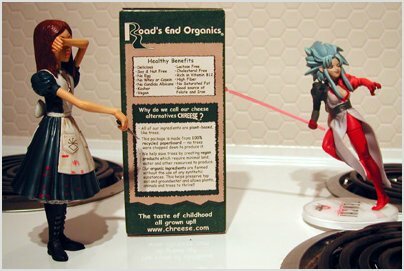 Ryoko: Hey, doesn't sound bad at all, what is wrong with "organic whole durum flour" and "organic ground yellow mustard seed" and "organi.... AHHHHHHH"
Alice: WHAT THE HELL?!?!? WHY DID YOU PUSH THE BOX OVER ON TO ME?? Ryoko: Ohh... er, sorry! I just got so excited about all the fancy organic ingredients! Ryoko: Sorry!!!!! 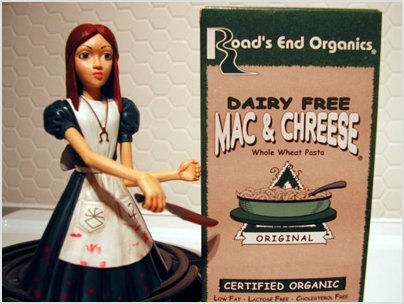 Ok, lets make some MAC & CHREESE! Alice: Lets just get this over with. 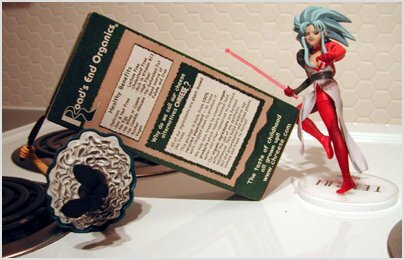 Ryoko: Hmm, okay, it says we need to boil water. Alice: Okay, you boil water, I'm going to go over here and pretend I'm not a part of this. Ryoko: Okay water is in the pot, stove is on, what's next? 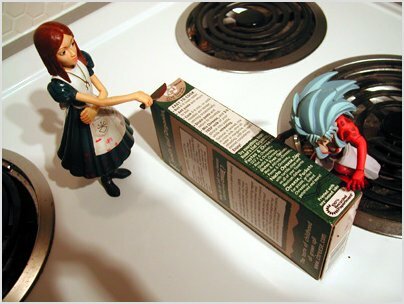 Alice: I don't know, open the box or something! Ryoko: Ewwww.... why is the pasta brown??? 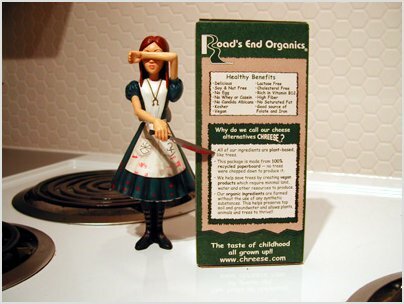 Alice: Because it's made from "organic whole durum flour", remember?